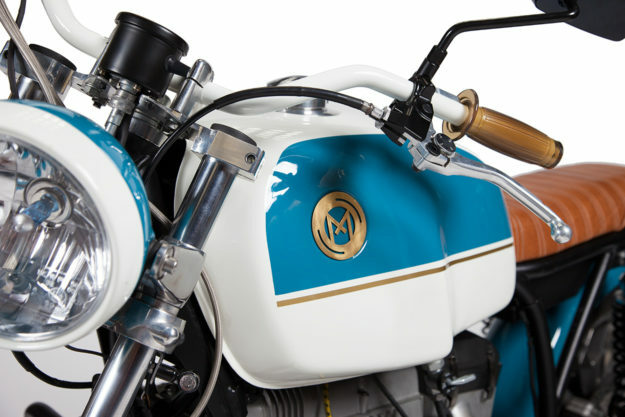 Most custom motorcycles start out stock—blank canvases for builders to splash their ideas onto. And if they’re old, a little restoration work usually comes first. 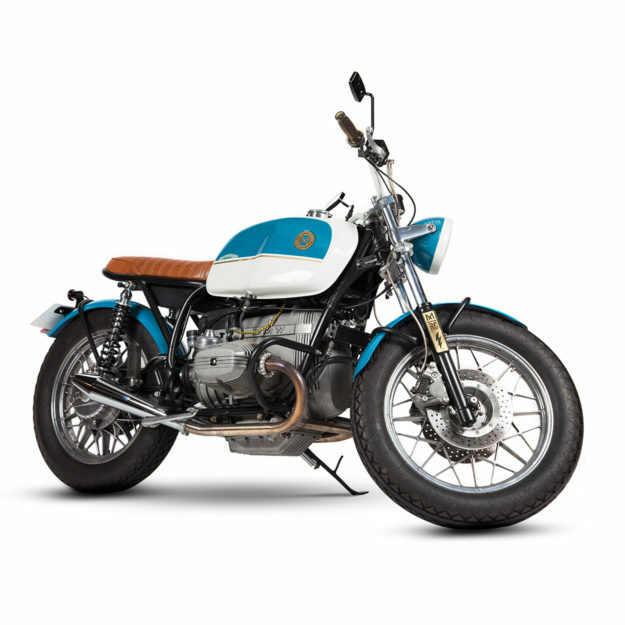 But this 1980-model BMW R100 RS was in need of complete salvation when it landed on Maria Motorcycles‘ workbench. Before they could turn it into the handsome machine you see here, they had to undo some nasty ‘custom’ work. Once the Maria crew had torn the bike down, they started sorting through the stock parts worth keeping. Then they set about cleaning and polishing the aluminum bits—like the triple trees and carb covers. The bulk of the man-hours went into restoring the engine. Maria rebuilt it with a host of new parts, and also glass-blasted it—adding a clear coat afterwards to protect the metal and seal in the beautiful finish. Their client’s love for old boxers stopped Maria from swapping out the tank for something smaller. 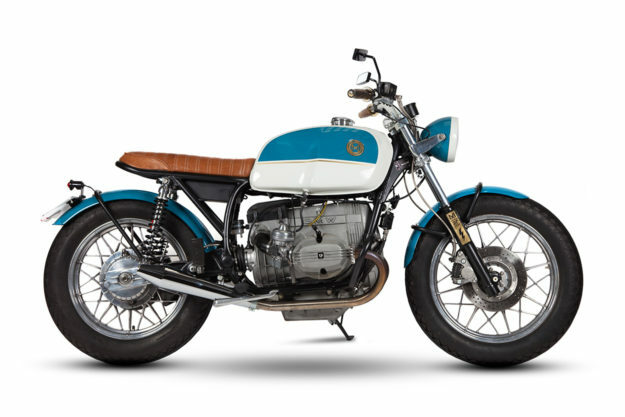 But the rear-end of the bike has been reworked—with a custom-made subframe and a hand-covered sheepskin leather seat. 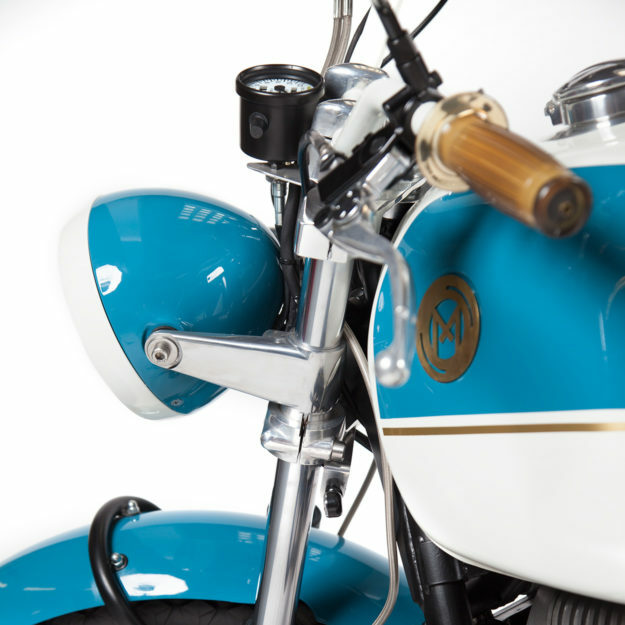 The fenders are aluminum items, mounted on hand-made brackets. 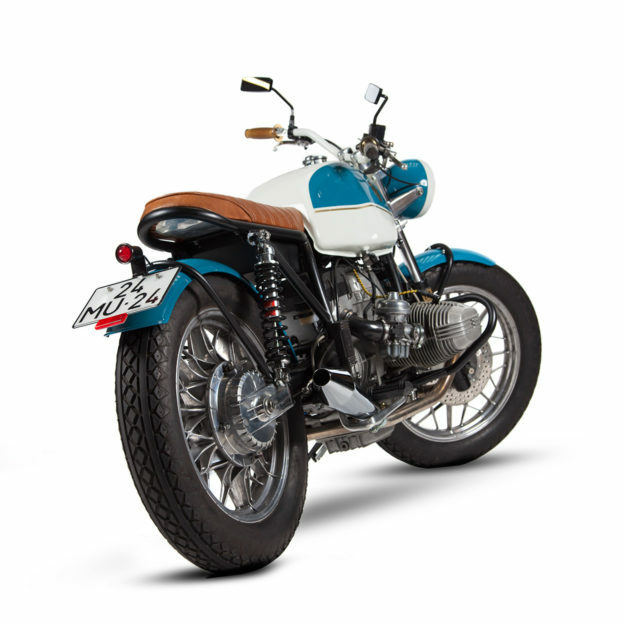 Mounting the rear fender using traditional stays rather than the subframe was a deliberate move, to keep the bike looking as classic as possible. 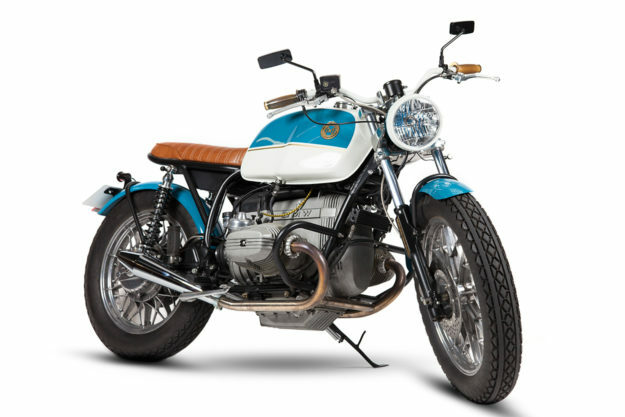 Maria tweaked the stance of the BMW R100 as well, by fitting new springs to lower the front forks. With new Bitubo shocks at the back, the ride is now much more controlled. The tires are Diamond-patterned numbers from Coker—“Almost mandatory for this kind of bike,” Luis jokes. New front discs and Hel lines give the brakes a little more bite, while a pair of aftermarket mufflers improve the soundtrack. The rest of the build is an exercise in tasteful parts selection: LSL handlebars, gum grips, new lighting and a Monza gas cap. 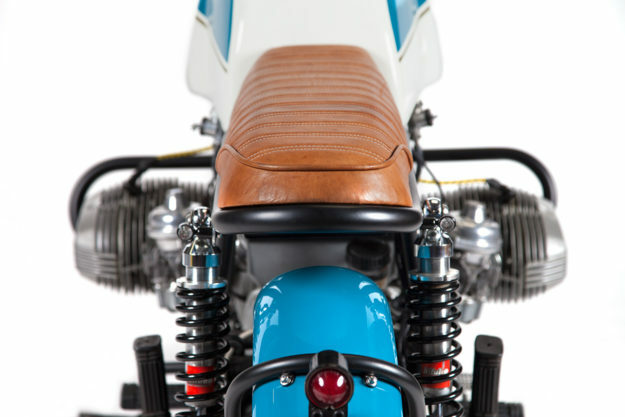 LED turn signals and a tiny speedo are mounted on hand-made aluminum brackets, and mini-switches have their wiring hidden in the bars. Every fastener has been polished or swapped out for a stainless steel replacement. 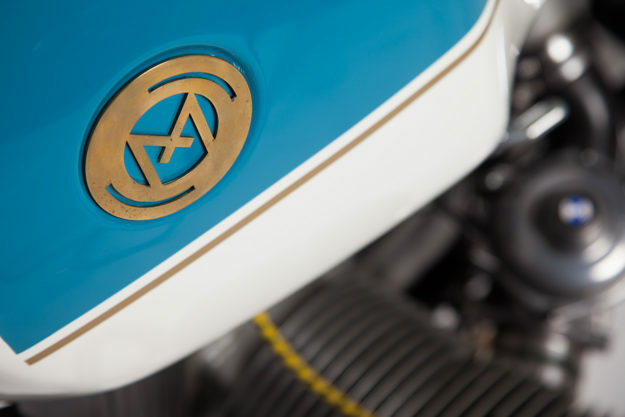 As an added touch, Maria designed and laser cut various brass details to mount throughout the bike. It works. 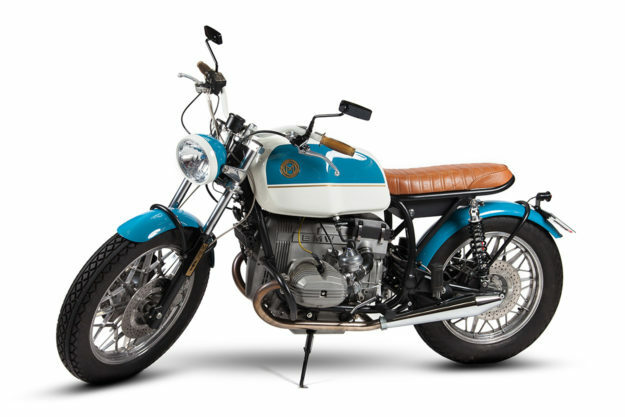 This once-hacked airhead is now the sort of machine we’d pick for an elegant Sunday ride. 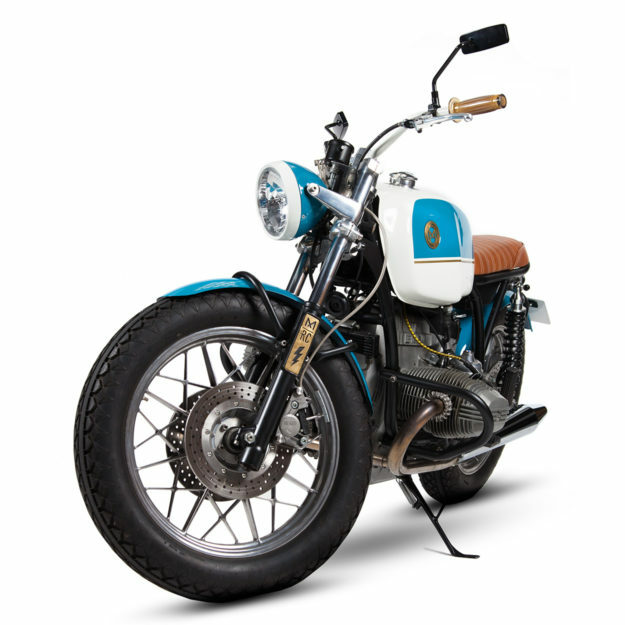 Not that it’s a slouch—Luis tells us the mods have made for a lighter, more rideable bike.